The word metabolism is derived from Greek and simply means ‘change’ or ‘transformation’. Human metabolism represents the sum total of all physical and chemical changes that take place within the body; the transformation of food into energy, the formation of new compounds such as hormones, the growth of bone and muscle tissue, the destruction of body tissues, and a host of other processes. Metabolism aids digestive function as well as absorption of nutrients and is most affected by nutrition, hydration and physical activity. Each of these factors is an imperative contributor to optimum metabolic health. When any one of them is deficient, the metabolic rate decreases. 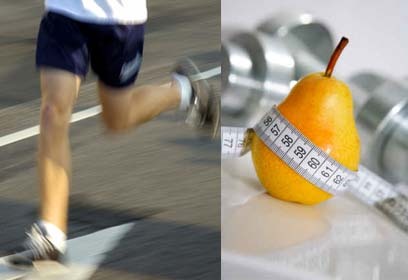 Consequently, weight loss and weight maintenance are directly related to healthy metabolism. While lowering your kilojoules/calorie and fat intakes may be important components of weight loss, both decrease your metabolism, making it essential to stimulate the metabolic rate through other means such as routine physical activity. It is not a good idea to skip meals or to reduce kilojoules/calories by a large amount, since decreased metabolism causes the body to burn fewer kilojoules/calories and less fat. It may also cause your body to store excess fat in reserve, defeating the object of the lower kilojoule/calorie intake. Human metabolic rate reflects how rapidly the body is using its energy stores and this rate can vary depending on a number of factors, the most influential one being exercise. Always eat breakfast in the morning. Breakfast is a great way to break the fast. Whilst research has shown that breakfast causes only a slight increase in metabolic rate (mainly due to the energy cost of digesting and absorbing food), it does in fact help boost your energy levels and improve concentration. Increase the amount of everyday activity. As a person becomes fitter and gains muscle mass, they increase the amount of kilojoules burnt at rest, plus they are more likely to use fat as a fuel source. However, the energy intake needs to be sufficient to meet the demands of your exercise program. If there is too little energy intake this imbalance may eventually reduce resting metabolic rate. Start doing some resistance/weight training which will help to increase your muscle mass. The more muscle you have, the more kilojoules/calories you burn regardless of how active you are or how old you are. As we age our muscle mass decreases. Adding resistance training to your workouts will help to maintain muscle mass. Eat foods that contain capsaicin, such as hot chillies. These types of food may elevate metabolism slightly and research has shown that eating them actually suppresses appetite, therefore reducing food intake. Keep the fluids up. Hydration levels are extremely important in the role of metabolism, as over 70 per cent of bodily functions take place in water, so insufficient water causes all of your systems to slow down. Aim to drink at least two litres per day, increase this amount if you are exercising, especially in a humid environment. Make sure you are getting enough sleep. Regular sleep is important in maintaining optimal metabolic function. The most important factor that can increase the metabolic rate in general is exercise. Any physical activity will raise the metabolic rate, and will keep it slightly elevated post exercise.